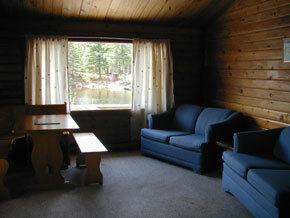 Cabin 5 is the second in our group of meal plan cabins. 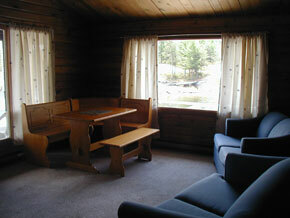 This cabin is a cedar Pan Abode located to the right, or West, of the Main Lodge. 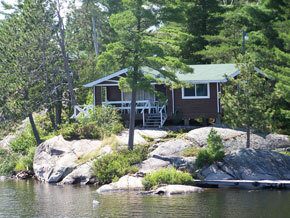 This cabin is boat access that can be walked to from the lodge with approximately a 2 minute walk. 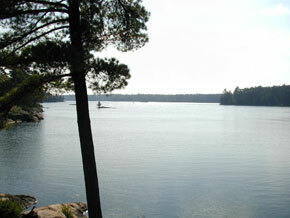 The closest building to it is cabin 4 which is approximately 300' on the back right hand side. This cabin is located above the water on the tip of a peninsula with water on three sides. There is a covered porch with deck on the side has a propane gas grill and chairs. It has a great view looking out onto West Bay making you feel as though you were sitting on top of the water. 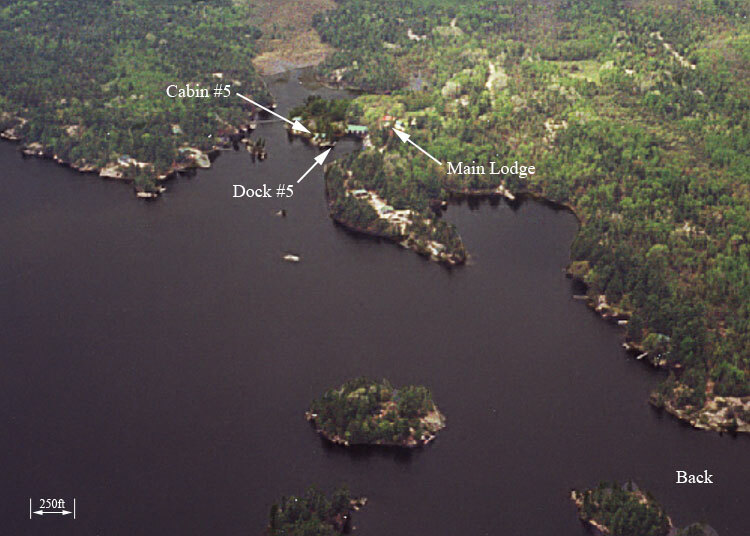 It has a private dock able to accommodate up to 3 private or rental boats with electricity from the cabin about 100 feet away. The unit is extremely clean and has the following amenities. In a nice size living room you will find two loveseat sofas, a 32" color television with DVD player (for DVD viewing only), a table and chairs/benches with kitchenette, an 18 cubic foot refrigerator/freezer, microwave, coffee maker and toaster. The cabin can accommodate up to 8 persons in 4 bedrooms with 6 single beds & 1 Queen bed with linens and pillows a small night table with reading light. There is a 4 piece bathroom with bath/shower, vanity and low flush toilet. This cabin is heated by individual room electric baseboard heaters so that you may warm the cabin up for those cooler early spring and late fall nights and mornings. A ceiling fan in the Living / Kitchenette area for those hot summer days. This cottage has hot and cold potable water for drinking tested monthly.